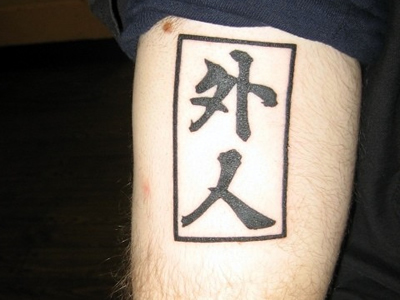 While spending some time in Japan, I was lucky enough to get the kanji for "Dragon soul" tattooed on my arm at a studio in Tokyo. The artist helped me translate the phrase into kanji. Hmm.... but does he really think it means "Samurai" or "Dragon soul"? The story is a bit inconsistent. Or does he really know his tattoo 外人 really means "foreigner" and is he just yanking our chains? Anyway, it's funny either way.